Submitted by Alexander Briones on May. 1, 2018. Drawing from our extensive research, we bring you a guide to the best MIDI keyboard controllers that caters to those with a specific budget in mind. As the title suggests, this list features the best of what the sub $1000 market has to offer, divided into three popular price brackets for your convenience, the sub $200, sub $500 and sub $1000. This way, you can narrow down your selection to the best ones that you can actually afford. While portability is always a big consideration when it comes to MIDI controllers, our research shows that modern Bluetooth connectivity is quickly becoming just as important, as exemplified by the three controllers in this section. 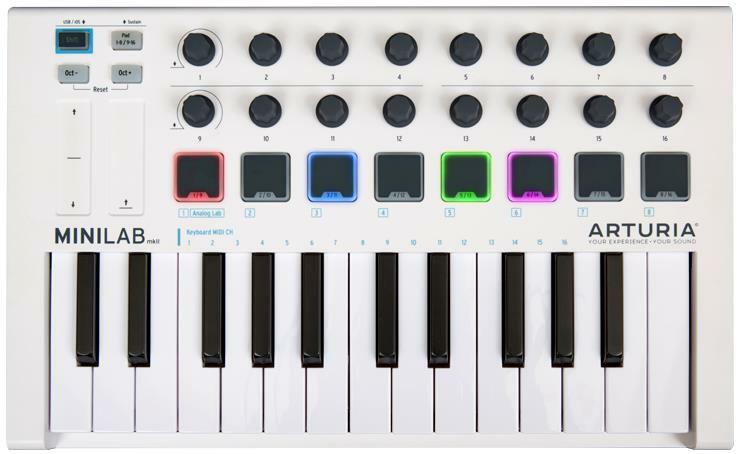 The Arturia Minilab MKII is a compact USB MIDI controller with an impressive array of controls, specifically designed to meet the needs of electronic musicians. What separates it from the pack is its 16 encoders, which allow for realtime controls over filters and other parameters, and add to that its built-in RGB lit pads, which expands your control options even further. Instead of using mechanical wheels, Arturia implemented two touch strips for controlling pitch and modulation, adding to the unit's futuristic appeal. All of these extras add to its 25 synth action slim size keys, which wraps up its instrument functions. From its stylish appeal, to the feel of its keys, and even on to its robust build, response to the Arturia MiniLab MKII continues to be highly positive. Music Radar confirms what most users say by describing it this way: "Amazing build quality, great keyboard". The quality of the bundled software also got a lot of commendations. And while this keyboard is meant for electronic musicians, even those who are into other musical styles chipped in with their good feedback. There are a few who felt that the bundled software is a bit lacking, especially when compared to the previous version, but they are very happy with the improvements on the hardware. If you're looking for a compact yet versatile MIDI controller, then the Arturia MiniLab MkII, with its extensive control options, is highly recommended. With Korg's vast experience and good reputation in the musical keyboard area, it's not surprising to see many of their products enjoying popularity. The microKEY AIR 49 joins this list with its combination of portability, playability and the convenience of modern wireless connectivity. It is as straightforward as they come, with just the keys, mod wheels and octave controls, which means that if you're looking for something more electronic music friendly, you should skip this entry. Still, you are getting 49 Korg quality keys, which allow for more conventional piano playing style, while keeping the form factor compact and the price very affordable. In addition, with its built-in Bluetooth technology, this MIDI keyboard makes for an ideal mobile instrument to pair with laptops, tablets, phones and other mobile devices. Most of the commendations that the Korg microKEY AIR 49 gets are from iOS users who love the convenience of wireless connectivity for mobile use. They appreciate how easy it is to connect and use with the iPad and even the iPhone. In addition, it has also made its way into home studios, many of which commend the unit accordingly. There are some users who are no too happy with the unit's overall build quality, with some specifically pointing to its plastic exterior as a concern. If you're looking for a simplified keyboard controller that's easy to setup and carry around, then check out the MicroKEY AIR 49. MIDI Keyboards with quality pads, encoders and faders got the top ratings in this section. 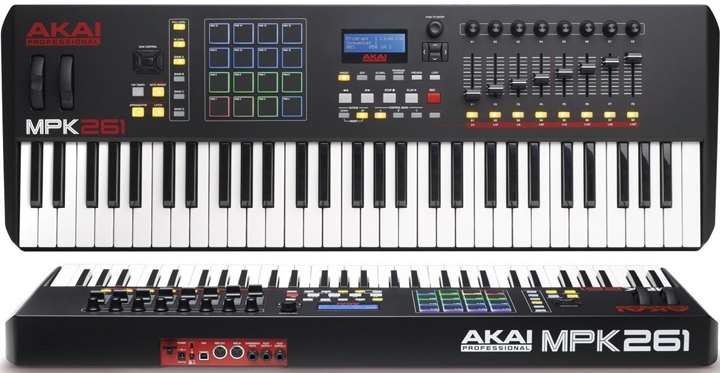 The Akai Professional MPK249 is a full featured MIDI keyboard controller that is still reasonably priced and portable. At its core are 49 full size keys that are semi-weighted for improved feel and response, and this is complimented by after touch control along with two wheels for adjusting pitch and modulation. While you can already make good music via its keybed, Akai Professional decided to add more control options, including RGB illuminated pads, multiple encoders, buttons and faders; all of which can be assigned to your preferred parameters. Other features include those that enhance workflow, including a built-in arpeggiator, MPC Swing and Note Repeat. Value for money is easily its most outstanding feature, as attested to by most of the reviews. Users are generally pleased with the overall performance of the keys, while others are impressed with its wealth of control options and its reliability. Reports of it working well with many different DAWs also fill up the comments. There are a few users who are not too impressed with the way the keys respond, while others wish for more features, which is quite surprising given the extensive control options that are already available. With its extensive control options and full-sized keys, the Akai Professional MPK249 is easy to recommend. With special emphasis on its deep integration and automap compatibility with popular DAWs like Cubase, Reason, Logic Pro, Nuendo, Bitwig Studio and Reaper, the Nektar Panorama P4 is specially designed for studio work. As a keyboard controller, it comes with 49 full-size keys, all of which feature Aftertouch and are semi-weighted. But more than that, it houses an extensive array of controls to ensure that you have access to most of the features of your DAW software, this includes 16 encoders, 12 pads, transport controls and more. With so many things that this keyboard can do, it is nice that it has a colored TFT display, which gives you good visual feedback of your settings. 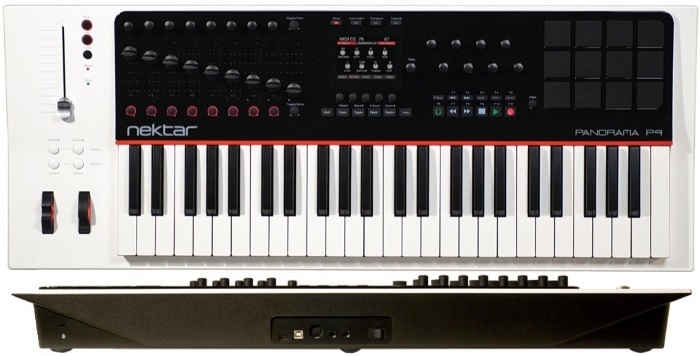 Dimensions: 33.25" x 13" x 3.25"
A good number of users describe the Nektar Panorama P4 as the best MIDI keyboard for Reason, but its not just limited to that because there are also reports of it working nicely with other DAWs, some of the most prominently mentioned include Cubase, Logic Pro and Reaper. A lot of users also love the Panorama P4 for its convenient integration and ease of use. The feel and response of the semi-weighted keys also prompted many users to give this controller high ratings. While many appreciate its semi-weighted keybed, there are a few who find the feel to be too stiff, but this is most likely due to them being used to softer synth style keyboards. There are also some who caution that while the automap settings generally work, you'll need to familiarize yourself with the settings, or better yet personalize them to get the most out of the controller. If you're using any of the DAWs listed above, and you're looking for a studio friendly MIDI controller then get the Nektar Panorama P4. Akai Professional's MPK series gets another spot in this list, secured by the high ratings of the 61-Key MPK261 MIDI keyboard controller. It is as feature packed as its smaller sibling, with the main difference being its longer 61-key configuration, having the same full-size semi-weighted keys with Aftertouch control. Pitch bend and modulation wheels are also present, along with other keyboard related controls including, octave up and down. For triggering samples in realtime, the MPK261 is equipped with 16 RGB illuminated pads, with each one having 4 banks, allowing for a wide selection of samples to utilize for your recording or performance. Other features include 8 encoder knobs, 8 faders, and transport control. Reviews are replete with positive references to the Akai Professional MPK261's build quality and playability, with specific references to how solid the keys, knobs and pads feel. Some even go so far as hail the MPK261 as the best that they've ever tried. The playing feel of the semi-weighted keys also got a lot of good remarks, including from experienced players. There are no notable complaints, other than a few who prefer the softer feel of synth action keys. The Akai Professional MPK261 offers professional playability, reliability and functionality, while keeping the price tag accessible. With a higher price margin, these controllers offer semi-weighted or fully weighted keyboards, which unfortunately drew flak from some who prefer softer synth style keys. Still, these are the ones preferred by experienced pianists and keyboardists. The Panorama P6 secures another spot for Nektar with its combination of a 61-key keybed, wide range of controls, and DAW compatibility. It's designed to control all DAWs but specialized in Bitwig Studio, Cubase, Nuendo, Logic Pro, Reason, Main Stage, and Reaper. Because Nektar Panorama controllers are pre-mapped for these 5 DAWs, every control feature in your DAW software is accessible via the pads, faders, encoders. Finally, it has a central display that shows you what parameters you are controlling in real time. Dimensions: 39" x 13" x 4"
Market response to the Nektar Panorama P6 continues to be overwhelmingly favorable, with most users commending it for its playing feel and solid build. There are many who report that this controller made a big impact in their workflow and productivity, while others are very pleased with how easy it is to set up via automapping. There are a few users who complained about the instruction manual, which they feel does not do the Panorama P6 justice. Some users caution that there will be a slight technique adjustment when you're used to synth action keys. With its reliable and versatile design, the Nektar Panorama P6 should be high in your list if you're looking for a 61-Key keyboard control in the sub $1000 range. Native Instruments is well known in DJ circles because for the quality of their Traktor software, they also expanded into music hardware which includes the Komplete Kontrol S61 MK2, a 61-key MIDI keyboard controller. While it does not have many DJ friendly functions, it does retain the company's standard for quality, as evidenced by its many good ratings. To achieve its success, NI equipped this controller with a semi-weighted Fatar keybed, and paired it with essential controls that include pitch bend and mod wheels, 8 touch-sensitive knobs, a touch strip and a 4-directional push encoder. It doesn't have much else in terms of design features, but the keys themselves are more then enough to make it a viable top rated instrument. Dimensions: 39.6" x 11.7" x 3.3"
The Native Instruments Komplete Kontrol S61 MKII continues to gather good reviews, most of which are from people who are impressed by the quality of its keyboard . Even those who owned its first iteration found that the MK2 brings with it significant improvements to their overall workflow and performance experience. A good number of users also commended it for the solid feel of the knobs, buttons and keys. And as expected, those who are already using Native Instruments' software are happy with easy it is to integrate into their setup. There are some complaints about keyboard mapping not working as they hoped it would. There are also a few who noticed that some of the Fatar keys produce unwanted mechanical noise as they release them. If you're using Native Instruments software, or if you're looking for a more streamlined 61-Key MIDI keyboard controller then check this out. 83 out of 100. Incorporating 80+ ratings and reviews. While the focus of this review is on the actual hardware, we can't help but mention that the Arturia KeyLab 88's main selling point is its great combination of hardware and software. The keyboard aspect by itself is already quite impressive, with its 88 Fatar hammer action (fully weighted) keys that even acoustic pianists will appreciate. Velocity sensitivity, pitch bend and modulation allows for even more control over the expression of each note. And it doesn't stop with just an impressive keybed, because it comes with DAW friendly pads, faders, encoders and other control options. On the software side, the KeyLab 88 is bundled with Arturia's Analog Lab 3 application, which greatly expands your sonic palette with over 6000 presets for a wide variety of virtual instruments and synths. And since both the hardware and software are from Arturia, you can expect seamless integration and quick setup. Dimensions: 50.82" x 13.89" x 4.25"
Beautiful, terrific and awesome are just some of the many positive adjectives that reviewers continue to use to describe the Arturia KeyLab 88. And while most of the high ratings are from those who are impressed with the hardware and its traditional piano like playability, there are others who are just as impressed with its bundled software. Music Radar's Stuart Bruce concludes his review by saying: "An instrument that you will want to play, stacked full of great sounds, easily tweakable and with excellent performance control. We think you'll like it!" There are some users who report inconsistencies with the unit's velocity sensitivity, saying that some keys require more force than the others. There are also a few who feel that the price should be a bit more accessible. If you're looking for a versatile 88-key MIDI keyboard controller, then the Arturia KeyLab 88 is your best bet. Not all keyboards follow the standard piano size and action because it's not always applicable, especially when considering portability. This is the reason why compact controllers come with slim size keys, which requires some technique adjustment for those who are used to standard size keys. Key weight and action refers to how hard you have to press the keys to trigger a sound. Synth action keys have the softest playing feel, while fully weighted (hammer action) ones need a bit more force, similar to an acoustic piano. Others offer something in between, which they call semi-weighted. Velocity sensitivity refers to how the keys respond to the dynamics of your playing or how forcefully you press the keys. While Aftertouch adds effects depending on the pressure you apply as you hold down a note. Your choice of size, action and sensitivity will boil down to your budget and preference, which is usually similar to what you are used to playing. Zones let you split the keyboard into multiple sections which each transmit on separate MIDI channels. An example of this type of usage is when you have one sound module for bass sounds and another for piano or synth sounds and you split the keyboard so that your left hand plays the bass sounds while your right hand plays the other sounds. These days many MIDI controllers do not have this feature built-in, but DAWs and some plugins will allow you to set virtual zones to your preference. Note that you need this feature on the keyboard to do it when directly controlling hardware without a computer in the loop. If you're looking for more control over your notes, you'll want a controller with pitch bend and modulation. Other features like encoders, buttons and faders allow for even more expressive control over parameters in real time, and they can be used to control your DAW software and plugins. Most are now using MIDI controllers to trigger virtual instruments in computers, and this is done mostly via USB, but there are some that allow for wireless use via Bluetooth. To trigger other hardware like analog synthesizers, you'll need a controller with a 5-pin MIDI cable connection. While most MIDI controllers have auto-mapping, they are usually limited to specific software. And since DAWs and plugins can be very different - it will benefit you to get a MIDI controller that is designed to integrate well with your preferred music production software, otherwise you'll have to manually map the keyboard to your software. Transport controls allow you to gain control of essential recording and playback controls right on your MIDI keyboard, this usually includes play, record, stop, forward, rewind - much like old tape machines. Some controllers come with motorized knobs and faders, which mechanically moves to match the current settings in your DAW. This is a convenient feature to have, but since it requires additional moving parts, it adds to the overall weight and bulk of the unit, and will generally add to the cost. Balancing portability and functionality is tricky yet important if you want to be productive musically. If you're going to make music while on the move, you're going to want to sacrifice some features and go for something light and compact. On the flipside, you should go for bigger controllers if you're style of music requires you to play conventional piano style music - these are ideal if they are simply going to stay in your home studio.